In the fabulous sixties, having a robust transmission meant having four speeds. The box itself is limited in size, and strong gears had to be big gears. Improvements in metallurgy and power takeup (clutches, especially) have made five-speed transmissions popular for the past thirty or so years, as design and material improvements allowed stronger transmissions that could fit in sporty-sized cars. The TKO is really the trans behind Tremec's aftermarket success. The Magnum is essentially all the best flexibility features of the TKO, combined with the spectacular refinement and torque carrying capabilities of the TR-6060. Designers learned that the side-loading transmissions so loved by GM had some inherent weaknesses, not problematic when they were bolted to the relatively anemic engines of the day, but obvious when hot-rodders got to work; Ford’s top-loader was an improvement. Then GM built the Muncie M-22 “Rock Crusher,” Chrysler introduced its big HEMI 18-spline A-833, and the race was officially on. Aluminum cases, with intricate ribbing, can now be stronger than the old cast iron; internally, steels are better-developed; inspection, manufacturing consistency, lubrication – progress on every front. Sometimes, though, you just need it to be bigger. 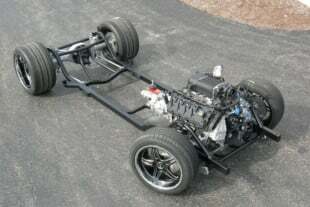 The Tremec’s T-56 Magnum has all the improvements. And yes, in some dimensions, it’s bigger. So now, we can have six speeds, and allow our better engines to use more of their improvements doing what they like to do: pushing pavement behind us. Borg-Warner developed the end-loading six-speed T-56 two decades ago, for its first use in the 1992 Firebird. It found its way into other GM products including the Corvette; then it proliferated further. Tremec, building transmissions since 1964, makes gearboxes for some of the most sought-after road vehicles, for heavy equipment that produces 2400 ft-lb of torque, and for some military vehicles. They build some 300,000 transmissions each year. Eventually, Tremec bought Borg-Warner’s light-duty operations. Today, the T-56 lineage remains in production as the fully-redesigned six-speed TR6060, first used in the Shelby GT500 at its debut a few years ago. Tremec supplies the S197 Magnum gearbox for 2005-and-up Mustangs as well as the TR-6060 from the GT500 Mustang. Note the unusual 'semi-remote' shifter arrangement on the 6060, as well as the long extension housing on the S197 Magnum designed to take its place. One other special point of interest is the crossmember and SFI-approved steel bellhousing that comes with the S197 Magnum. Previously Tremec never offered these items, but due to the expected demand Tremec provided these pieces to make the swap simpler and more cost effective. End users will still need to acquire a 26-spline clutch and appropriate driveshaft to make the full conversion (will be available through Tremec Elite Distributors). The Tremec TR6060 is used in all Corvettes, Cadillac CTS-V; the Viper and RT and SRT Challengers; all GT-500s, including the SuperSnake; and all new Camaro SS and ZL-1. Still, if you were to pirate one of these from a junkyard, you’d face myriad problems. The Magnum is a 6-speed box, with triple-cone synchronizers for the first four speeds and double-cone synchros on the overdrives and (constant-mesh) reverse. They feature robust and standardized 26-spline input and 31-spline output shafts. To make retrofits easier, they have electric and mechanical speedometer hookups; mechanical or hydraulic clutch linkage will work. The T-56 Magnum will be available in configurations for 4.6 and 5.0L Fords, LS1 GM applications, as well as for the conventional small-block Chevy. Custom bell housings will be available through most Tremec distributors for other applications. The T-56 Magnum features 6-fully synchronized forward gears as well as a synchronized reverse. All T-56 Magnums feature a rigid die-cast aluminum ‘short throw’ shifter that offers tremendous strength with smooth, positive shift action. It also features the same ‘reversible’ function as the wildly-popular Tremec TKO 5-speed shifter for added versatility with respect to shifter location. Stealing another page from the TKO, Tremec also designed the Magnum to include both electronic and mechanical speedo pickups. The Magnum has several internal ratio sets available. Tremec has a lot of help available on its website, plus a detailed online Applications Engineering form, that will help you match your needs to their models; and both Tremec and several of the distributors maintain help lines; some are manned 24/7. Specifically regarding ratios, fourth gear is direct-drive (1.00:1) in all the Magnums; fifth and sixth are each overdrives, with three ratios available, all the way to 0.5:1 – so sixth gear can be twice as tall as fourth, for thumping down the highway, and the space between fifth and sixth is much easier to bridge than with just a five-speed box, where the leap to overdrive could be radical, and annoying. T-56 is a family, though, you can’t swap one T-56 for another and expect everything to work, or even to fit. You can’t expect to bolt the new Magnum in, either; that’s where the Tremec distributors come in; all of them know their stuff. The model numbers for the Magnum configurations specify the ratios, to deliver a range of wide-ratio or close-ratio solutions for various engines. Note, for instance, that if you order the lower first/second pair of gears, you automatically get the higher fifth/sixth. If you purchase a 2.66 first-gear ratio version, you get the lower overdrive ratios (.82, .64); if you get the 2.97, you get the higher (.74, .50). But a Tremec distributor can change the overdrive ratios – and yes, you’ll need to change them both – if you think you need your box set up that way. Since adaptability is another attribute of the Magnum (strength and smooth operation being others), it bolts to many aftermarket bellhousings, and also to many stock GM bellhousings; a reverse-lockout solenoid is standard. A shifter comes on the transmission, and you can have it work from any of three positions on the box’s centerline. The rear-shifter is supplied standard, and it’s reversible to provide two popular positions: you can mount it with the stick at the front or rear of the cover. The farther-forward “mid-shifter” option is also available. And distributors have offset shifters, to move the stick position left or right as far as two inches. A stand-alone view of the gears (top right) shows the substantially increased face width of those used in the new Magnum (left) as well as a fantastic look at some of Tremec’s new manufacturing processes at work. Rather than forging the gears and clutching teeth all as one unit, as was done in the past, Tremec now laser welds together the two separate pieces. This allows for a much more intricate design of the clutching teeth, including a finer pitch on the teeth themselves as well as machined-in positive stops. The process provides a noticeable improvement in shift feel and makes ‘overthrows’ a virtual impossibility. Also note the larger bore of the gear to accommodate the heavier-duty mainshaft of the T-56 Magnum. The images illustrate the new and improved shift forks of the T-56 Magnum (positioned in rear). Note the substantial amount of added cross-sectional material for increased strength as well as the new integrated shift links. This feature is important because the links now have their own separate provisions for placement rather than loosely fitting into a keyway shared with the rail bore. What this does is promote a more precise shift feel along with helping to virtually eliminate deflection of the fork itself. Always check shift handle length. Some will sit too high or too low. Get the handle last, after the seats are installed. The similar-looking T-56 box has been around for decades, in various configurations. T-56 is a family, though, not a specific transmission; you can’t swap one T-56 for another, and expect everything to work, or even to fit. You can’t expect to bolt the new Magnum in, either; that’s where the Tremec distributors come in. Tremec distributors have their particular specialties – drag, road race, pro street, etc. ; all of them know their stuff. At Tremec, one could see the whole manufacturing process, from the raw bar stock coming in the door, through forging, into machining, assembly, inspection, and test – and into the box. That allows Tremec to control the entire process, and it results in consistent quality. In this image you can see the only feature deleted from the T-56 with the advent of the Magnum—the 10-spline input shaft. While it’s not unheard of for enthusiasts to jam big power through a 10-spline setup (they’re especially common in late-model Ford circles), Tremec engineers decided to remove any potential weak points before rating the Magnum for 700 ft. lb. street/strip duty. Saving space for strength: that’s what the Magnum’s new synchronizer design is all about. The physically narrower design is what allowed Tremec to equip the Magnum with wider gears as well as add some extra meat to the front and rear of the main case. These new synchronizers feature increased capacity over their predecessors and utilize a new support system with individually spring-loaded ball type inserts. A vast improvement over the old hoop-style strut, these new inserts control loads with far greater precision. The compact design also translates to shorter throws and a smooth, over-center feel for the driver. This exploded view of the Magnum’s new synchronizers is beneficial in understanding some of the truly state-of-the-art technology at work. A lot has to happen in a very short time (see milliseconds) to make those high rpm shifts go quick and feel right. Making matters feel even better, the T-56 Magnum comes with triple cone synchronizers for the 1-2 and 3-4 shifts, and double cones for the 5-6 and reverse gears. Clutches are the other main causes of end-user frustration and dissatisfaction. Tovey stated, “An overly-aggressive clutch can make a big difference in drivetrain life. When you get into ‘racing,’ you’re losing drivability. The few milliseconds you’d gain shifting a full-race transmission will not be noticed anywhere but the track. But the drivability of a race transmission will ruin your enjoyment in just a few hours. Recently, clutch manufacturers have come up with dual-disk clutches; these, too may be a viable option.” Though Tremec does not endorse clutch products, you can get a lot of good advice from Tremec distributors in clutch selection. Here’s why: some synthetics (and Tremec hasn’t tested them all) actually erode the lining of the synchro materials. Using the wrong fluid can kill a transmission without your ever abusing it. For the old-timers, he notes that old-fashioned gear oil impedes the action of the synchronizers. When the cone presses on to the gear, the thick fluid will cause a slow, clumsy shift. A hypoid gear oil works likewise: the synchros require some friction, and these oils get in the way of proper mating, as they are designed to do! Tremec’s new T-56 Magnum is the long-awaited replacement for the T-56 and aftermarket equivalent to the TR-6060 that currently serves as factory equipment in many Vipers, 'Vettes, GT500s, Challengers, Camaros, CTS-Vs, and G8 GXPs. For a price tag of about three grand, it’s a worthwhile investment for anybody seeking the performance and practicality of six forward gears along with massive amounts of torque capacity. Clearly evident is the increased bulk of the Magnum’s input shaft, a good idea considering it’s the transmission’s first line of defense for major power handling. Tremec’s distributors are the best outlets, and each offers expert technical advice. Find the distributor that most-closely serves your application, and listen to what they say. Distributors will help with bellhousing selection, speedometer hookups, chassis mounting, slip yokes, driveshafts, clutch recommendations and linkages – everything you’ll need. 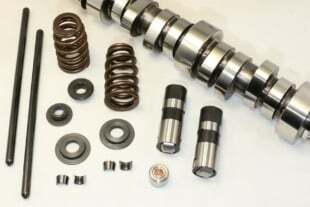 Many offer “kitted” transmissions, with the parts you’ll need to complete your particular installation. The torque rating goes from 450 ft-lbs to 700; the triple-cone synchros last a long time and make shifting sweet; vibration and noise are reduced; the convenience of being able to use either electric or mechanical speedometer hookups, of a bellhousing selection, of standard 26/31-spline input and output, and the adaptability of three shift lever positions can’t be missed. The Magnum is currently offered for GM LS and Ford Modular applications; Mopar is on the way. The difference is at the front of the transmission. Distributors will get you into the right bellhousing and adapters. Tovey wrapped it up: “People don’t pay a lot of attention to their transmissions until they make noise or pop out of gear. Based on the TR6060, this is by far the most refined aftermarket transmission ever released. Quiet, durable, easy-shifting, short-throw – all these have gone through the same kind of testing the OEMs use. It’s not just about power-handling. It’s about flexibility and refinement. In the aftermarket, you won’t find anything else that will give you the options you need, especially for the shifter location.